About 2,000 people have begun walking north from El Salvador's capital, the latest of several groups trying to reach the United States, as President Donald Trump increases pressure to halt the flow of people. The men, women and children departed in two groups. On Sunday, a separate group comprising about 300 migrants set off for the US border from the Salvadoran capital, San Salvador. A caravan estimated to number at least 3,500 people, which left Honduras in mid-October and is now in southern Mexico, has become a major issue in US congressional elections on 6 November. 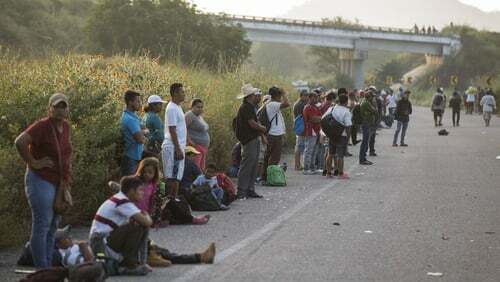 The bulk of migrants caught trying to enter the US illegally via Mexico come from El Salvador, Honduras and Guatemala. Many make the dangerous journey north to escape high levels of poverty and violence in their homelands. The US is in the process of sending 5,200 troops to its southern border as part of Mr Trump's crackdown on illegal immigration. The prospect has so far not discouraged people from leaving El Salvador. "It scares us a little. But since we're seeing a ton of people going together, we can help one another to cross," said Jose Machado, one of the migrants departing San Salvador, carrying a backpack stuffed with clothing and toiletries. President Trump, who has threatened to slash US aid to Central America and close the US border with Mexico, said in a tweet that Mexico needs to keep up efforts to discourage the migrants, who he described as "tough fighters." White House press secretary Sarah Sanders has praised Mexico's actions to slow the movement of people, but told Fox News: "They can do more." Police estimated the two groups leaving San Salvador numbered around 1,000 each. One group left around dawn, followed by a second later in the morning. Some waved Salvadoran flags as motorists honked in support and shouted, "God bless you."